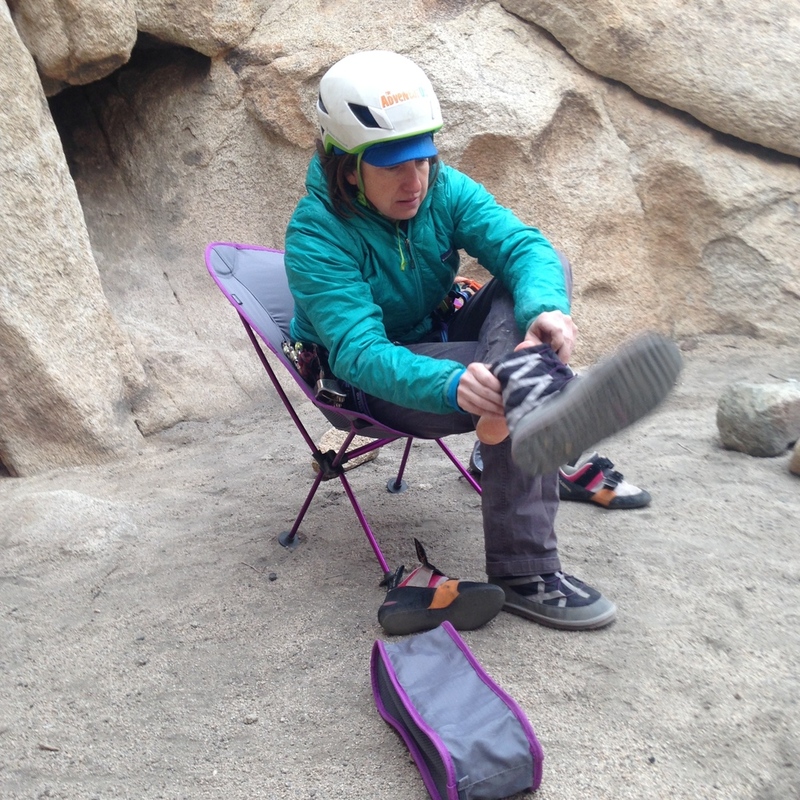 For 2015, the best-selling Joey Chair gets a makeover with five new frame and trim colors, new Anti-Sink Disc Feet for use in soft ground, and improved seat construction increasing support and ventilation. This lightweight, comfortable camp chair is perfect for backpacking, camping, river trips, the beach, and athletic events. With a weight just over 2 pounds and small packed volume this chair is easily carried in a backpack, dry bag, cycling pannier, or even a large handbag. The Joey has the highest seat height in its class and features a tough anodized drawn-aluminum frame made up of dual-shock corded poles for easy set-up and durability, and supports up to 300 pounds. Car camping, crag days, 9-day WFR certification course, and backyard BBQ’s. The small pack size and weight of this chair have me bringing it along in situations where I never would have brought a chair in the past…. i.e. hiking it into the crag for a climbing day or short backpacks where I am not counting ounces. The anti-sink feet make the chair very stable and non-tippy. It must be comfortable, as I have now fallen asleep in it more than once while relaxing at the evening campfire… and have not fallen over. Friends are genuinely surprised when I pull the Joey out of my pack and are eager to try/steal it. After a few months of use it is beginning to look used, but holding up great. I have yet to decide if it is worth the weight for quick and light backcountry trips. Pros: Extremely lightweight, compact, and stable. Poles are easy to set up and put away. Cons: Top and bottom of chair not easy to figure out at first and mine can be a bit of a struggle to get on poles due to snug fit. Older PostThank you Sierra Club.